Caspar Graf's Immigration Record-Where is His Wife, Mary? Why can I find the arrival of Caspar Graf, but not for his wife, Mary? I have scoured the records to no avail. Were Caspar and Mary married in Germany or the United States? 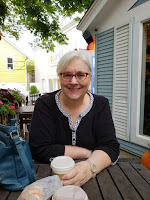 I have looked at marriage records in Germany, New York, and Indiana? Where are you hiding Mary? 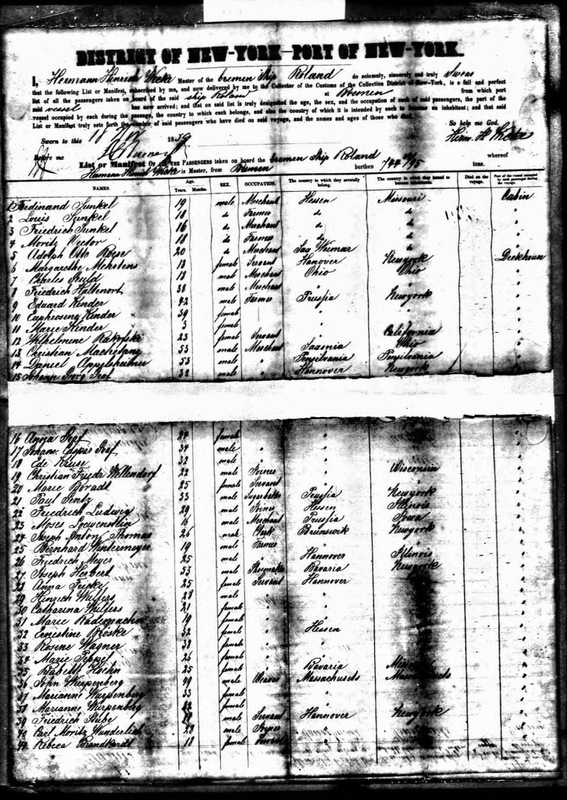 Source: "New York Passenger Lists, 1820-1957," database, Ancestry.com, Entry for Johan Casper Graf, arrival date 18 Nov 1859. Johan Caspar Graf, age 34, male, merchant, of Hannover, traveled from Bremen, Germany aboard the ship Roland, mastered by Hermann Wieke. He arrived at the port of New York on 18 November 1859. The country which he intends to be a inhabitant of is New York. I believe this is not Caspar's original trip to the United States for reasons I list below. Also, on the ship manifest is Johan Georg Graf, age 32, and Anna Graf, age 24. The other information for Georg and Anna is the same as Caspar. I know through other research that Caspar had a brother, Georg. This manifest does not have Mary or any children on it. The next year in the 1860 United States Census records, I find Caspar Graf (transcribed as Grove), living in Harrison, Miami county, Indiana with his wife, Mary, age 25; and children Caroline, age 7; Philippina, age 5; Jacob, age 3; and Philip, age 1. Information gleaned from this census record, which may or may not be accurate, shows that Caspar and Mary were born in Bayern; Caroline in New York; Philippina, Jacob, and Philip in Indiana. Using that information tells me that Caspar, Mary and Caroline were in New York by 1853. They have moved to Indiana by 1855 at the time of Philippina's birth. I looked without success at the 1850 U.S. Census Records for Caspar and/or Mary. Complicating the research further is that Caspar dies in 1869, leaving me with only the 1860 Census record for Caspar. I have Caspar's baptism record, though. He was baptized 19 October 1827 in Rockenhausen, Pfalz, Bavaria with a birth date and place of 14 October 1827 in Katzenbach. The 1870 Census complicates things a little because it shows Mary living in Harrison, Miami, Indiana with her children: Caroline, Philippine, Jacob, Philip, Henry, George, Valentine, and Elizabeth, all children born in Indiana! After I get over my admiration of Mary for being a widow and raising eight children, I go to look for more information. The 1880 Census has Mary living in Harrison, Miami, Indiana with Jacob, Philip, Henry, George, Valentine, Elizabeth, and Henrie Ettie. Henrie Ettie is age six and listed as a daughter. This is a problem for another day, with Mary's husband dying in 1859. Again, all children born in Indiana. This is consistent for the six children who were in the previous census. Mary dies in 1898, leaving me with the 1880 Census as the last one Mary is found in. Caspar and Mary's first born child, Caroline, who I am trying to find out where she was born, hoping it will lead me to more information, is not in the house at this time. The next thing I do is look for a marriage record. Caroline Graf married Charles E. White on 21 March 1871 in Miami county, Indiana. Since the record was an index only one, I need to find the original record and see if her birthplace is listed. Further searching shows marriages for Caroline and Charles White's children. One states her mother was born in New York and another says Indiana. I will not give up, I will not give up. I know I have only touched the very basic sources for Caspar and Mary Graf by using the census, marriage and death records. I can surmise that their daughter, Caroline, was born in the United States, probably in New York or Indiana. How does this help me with my original question of finding out when Mary Graf immigrated? It gives me a time frame of pre-1853 to look at. I need to find out when Caspar and Mary were married as well. Was it in the United States? or Germany? Another Graf researcher states Mary's maiden name as Wrightweasner, but I cannot confirm this. I can't even find that surname in any research. I have done. This show the best and the worst parts of why I love genealogy. I love the puzzle that it provides and working on putting all the pieces together, but it is frustrating to have conflicting information in so many records. What are my next steps? This is where I am asking my readers to weigh in. What would you do next? Please leave a comment and together we will find Caspar and Mary? Oh, and while I am at it I would love to confirm Mary's maiden name!